If there were a contest for Most Pathetic Giant Monster then Garamon would be a serious contender. 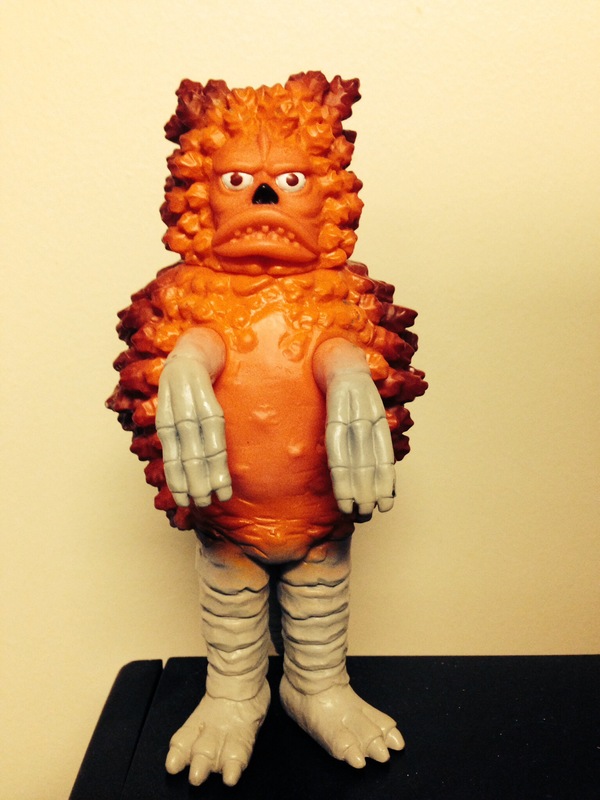 Appearing twice in the Japanese mid-1960s show “Ultra Q”, Garamon is a gigantic robot that looks like a cross between Big Bird, a gollywog, and a bucket of orange paint. It shuffles a little and flaps its big goofy hands futilely. When its guiding transmission signal is cut off, it falls over and drools. I feel a great deal of empathy for the stupid thing, being little more than a drooling giant myself. That’s why he sits on top of my cube wall, reminding me that at the end of the day I’m pretty much just a disposable (and not very respected) tool. So when I faced a drive to Monroeville on my own, I decided that it was time that Garamon went on vacation. Garamon needed a vacation before it got fed up and fell on someone. Last spring the Riverside Drive-In (Vandergrift, PA) hosted an 8-movie event called April Ghouls Drive-In Monster-Rama, a companion to the annual Drive-In Super Monster-Rama held there in the fall. Having been to several of the latter shows I’d had to try the new one (see We Are in the Quantum State of Possibly Being in Pittsburgh and And Then We Ate Cheeseburgers and Sat in the Cold to Watch Movies for how that went). This spring the event was held again — making it annual — and I had to go back. As the honorary navigator on such trips, I have learned that I cannot follow directions to save my life. This time out, as the pilot, I made sure to print out reams of directions… which I promptly discarded after turning the wrong way out of Manchester. From then on, Siri was my co-pilot. If Garamon had any reservations about the journey, it kept them to itself. Despite the bad start, I made it to Monroeville in good time. Unfortunately, that’s when my Fiasco Field decided to activate in full. Scott had left me a message on my cel with the room number and hotel phone where he and Jessica could be reached. I dialed from a rest stop but didn’t get an answer, so I tried again after checking into my own room at a different hotel. Still no answer. I dropped by and knocked on their door. Nothing. So I went to the Half-Price Books, because I know where it is, and I picked up a spiff collection of Marvel Team-Up for cheap. How could I say no to Spidey hanging out with whatever Marvel character had been on the bench too long? On returning to the hotel, I called once more. Rings for days. I walked over again. Knocked again. Failed again. Finally I went to the lobby and told my troubles to a doubtful clerk. She asked if I had the wrong number, so I called it up and tried one last time. As silence continued to emanate from the hotel phone, the slightest aura of smugness began to creep into her mandatory smile. Then she actually looked at the phone and was shocked to find that someone had turned the ringer off. I used the lobby phone and finally met up with Scott and Jessica. We went into Pittsburgh for Chinese food at a Cuban restaurant, then exchanged DVDs and forged alliances until I decided to rest up for the first night of movies. The following day we went book shopping, with a trip to Caliban Book Shop (a nifty used bookstore in Pittsburgh) and another stop at the Half-Price in Monroeville for some pulp science fiction. 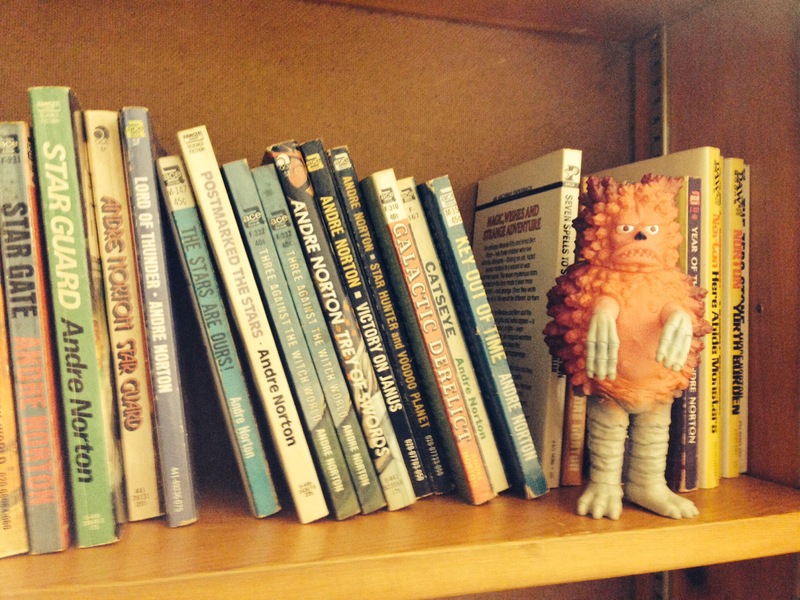 Garamon peruses the Andre Norton section of Caliban’s. We were eating at some local Tex-Mex chain when Josh called me. With most of our regulars from Michigan and Nebraska not able to make it to April Ghouls, Josh was slated to be our sacrificial newcomer. Part of the B-Movie message board that had more or less brought us all together (though many of us have long-since departed), we also had met him many times in Evanston for the annual B-Fest 24 hour movie marathon. He was calling to get directions to meet up with us before heading to the drive-in. A road in West Virginia closed due to accident had put him a few hours behind schedule. Being useless with maps, I handed the phone to Scott and ate my dessert. Eventually it was decided that we’d just meet up at the drive-in and hang out there until sunset. 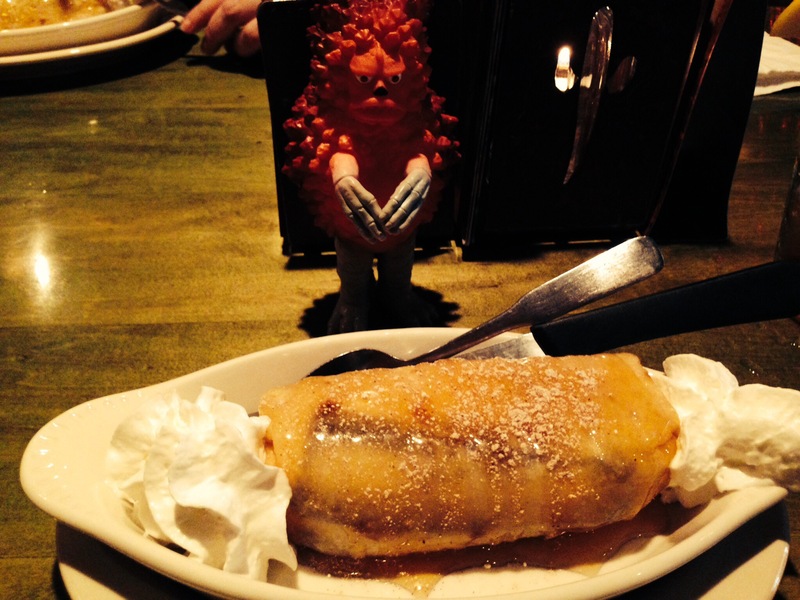 Garamon observes a solemn moment as we contemplate the majesty of an ice cream burrito. Details of the event itself will be in a later post, but there are a few items of note that I’ll relate here as they have to do with things taking unfortunate turns. Not like in driving — nobody got terribly lost or anything. The first sign was a minor one. Garamon took a header into a mud puddle. Nothing too surprising there, and arguably it was entirely within character. I picked it up and set it back by the radio, tuned to the drive-in’s frequency. Still, I left the mud on Garamon so it could reflect on its failings as a monster. The news filtered down during the third movie that Scott’s van was dead. It wasn’t responding to jumps, and there was some suspicion that it would need to be left in Vandergrift for repairs. Beyond basic human empathy, this effected me and Josh directly. I’d left my car at Jessica and Scott’s hotel and come with them. The only way back to Monroeville was for Josh to take us, but he’d intended to camp at the drive-in. Josh wound up driving us, and I hosted him in my room for the night. When we finally all met up again around noon, Scott and Josh went back to Vandergrift to check the vehicular situation. I took a long nap and promised to give Jessica a ride later. Here’s the miracle; everything worked out. The jumper cables were older than at least most of us and just had Low T or something. With younger, more virile cables the van started right up. Having caused enough trouble, the Fiasco Field subsided and let us enjoy the second night of movies. Plans were wrecked, but no permanent harm was done. We rolled with it, let events have their way, and had a great time. Like Garamon, we just needed a good radio and we were set. This entry was posted in Trips and Outings and tagged April Ghouls Drive-In Monster-Rama, trip, vacation by retrozombi. Bookmark the permalink. Poor, poor Garamon. He always looked so… Pathetically menacing, in an impotent way. I have one. My phone!